The solution to mix Nitrox, Trimix, Triox and Héliox while emptying B50. 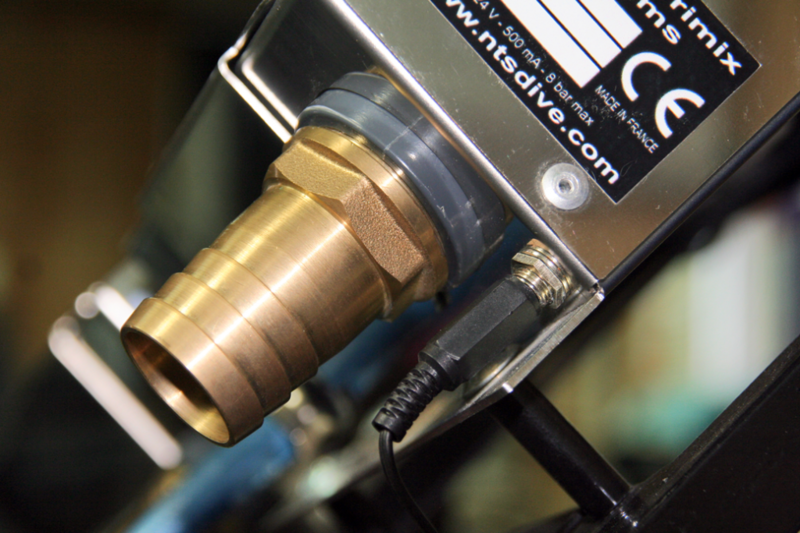 Allows to mix any Nitrox, Trimix, Triox and Héliox having a maximal rate of 40% of O2. 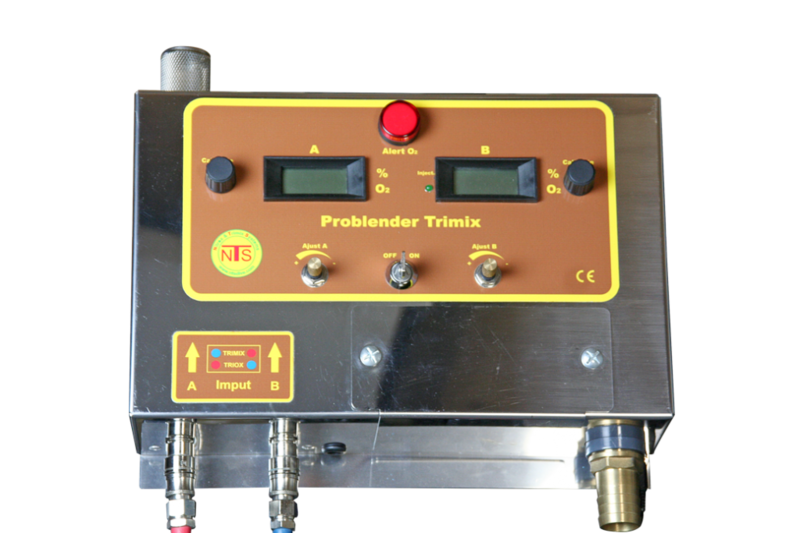 The technic consists in making Nitrox, Trimix, Triox or Héliox before compressing it by the mean of the compressor. That is why we must not exceed 40% of O2. Mix Nitrox or trimix directly usable after inflating. No use of helium probe – use 2 oxygen probes, no expensive and easy to find. As the mixture is made in atmospheric pressure, there is nos risk to manipulate oxygen. It is possible to empty completely gas tanks. 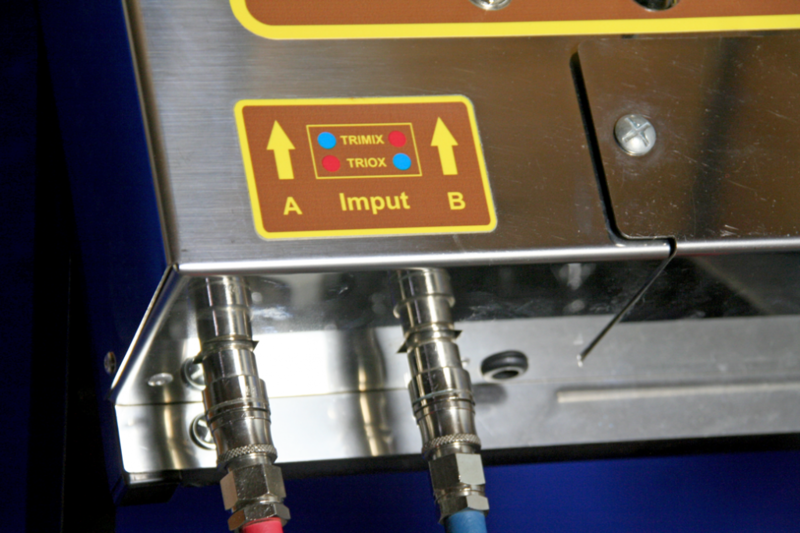 The system consists of an indutrial metallic case containing a double blender, two analyzers of integrated oxygen and an electronic of control allowing to secure the set. The case brings a professional touch to the assembly and prevents any deterioration of the system. The gas injection is made trough a manoregulator gone up on helium and oxygen gas tanks. A gate of lamination allows to refine the regulation of gas injection. An electro-valve is used to cut the gas supply in case of incident. The case of control allows to know in real time the oxygen rate of the mixture. the result of the analysis is showed on a wide size display. In case of the oxygen rate is overtaking, the system cut immediatly the arrival of gas ( oxygen and hélium) and a road marking light switch on. The system will be re-fed when the oxygen rate will pass below 40%. An entrance is planned the get back the information of compressor smooth running. So in case of cut, the oxygen supply is cut too and the raods marking light switch on. A key taken up on the front allows to block the system to avoid an accidental injection of oxygen or an inconvenient use of the system. Then it is still possible to inflate with air. 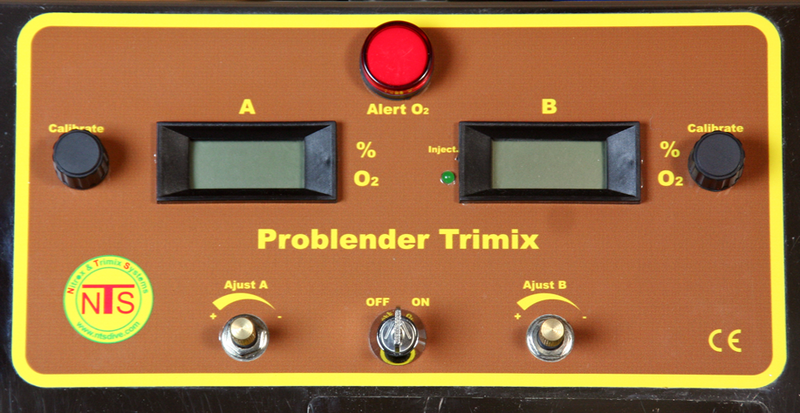 Problender Trimix is delivered with a software which allows to make regulations. It is enough to mark the wished mixture and the software indicates the procedure. Poblenders are delivered complete with manoregulator, oxygen pipes and O2 unit.